Review by AllTheBestFights.com: 2018-12-02, nice exchanges between Junior dos Santos and Tai Tuivasa: it gets three stars. The black belt in Brazilian jiu-jitsu and former Ufc Hw champion Junior dos Santos entered this fight with a professional mma record of 19-5-0 (74% finishing rate) and he is ranked as the No.9 heavyweight in the world (currently the #1 in this division is Daniel Cormier). ‘Cigano’ dos Santos lost the rematch with Stipe Miocic last year (Stipe Miocic vs Junior dos Santos 2) but he came back to win in July 2018 against Blagoy Ivanov (Junior dos Santos vs Blagoy Ivanov). His opponent, the undefeated Tai Tuivasa, has a perfect record of 8-0-0 (88% ko/tko victory rate – he has never won via submission) and he entered as the No.16 in the same weight class. He has already fought twice in 2018 winning over Cyril Asker (Tai Tuivasa vs Cyril Asker) and Andrei Arlovski (Andrei Arlovski vs Tai Tuivasa). JDS dos Santos vs Tuivasa is the main event of the UFC Fight Night 142. Watch the video and rate this fight! Review by AllTheBestFights.com: 2017-05-13, pretty good fight between Stipe Miocic and Junior dos Santos 2: it gets three stars (UFC Performance of the Night). The Ufc Hw champion Stipe Miocic entered this fight with a professional mma record of 16-2-0 (81% finishing rate) and he is ranked as the No.1 heavyweight in the world. He suffered his last loss when he faced Junior dos Santos in their first bout in 2014 (via unanimous decision, dos Santos vs Miocic), after this fight he has collected four victories winning the Ufc belt against Fabricio Werdum (=Werdum vs Miocic) and defending it once with Alistair Overeem (=Miocic vs Overeem). His opponent, the black belt in Brazilian jiu-jitsu and former Ufc Hw champion Junior dos Santos, has an official record of 18-4-0 (78% finishing rate) and he entered as the No.5 in the same weight class. 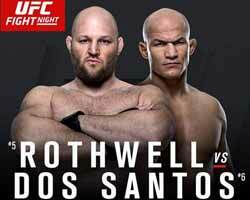 ‘Cigano’ lost to Alistair Overeem in 2015 (=dos Santos vs Overeem) but JDS came back to win in 2016 against Ben Rothwell (=dos Santos vs Rothwell). 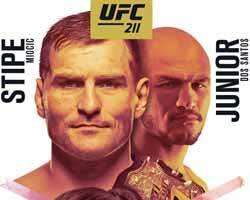 Stipe Miocic vs Junior dos Santos 2, main event of the Ufc 211, is valid for the Ufc heavyweight title (Miocic’s second defense). Watch the video and rate this fight! Review by AllTheBestFights.com: 2016-04-10, some good exchanges between Ben Rothwell and Junior dos Santos but it is not enough to get three stars: it gets two. The black belt in Bjj and former Ufc Hw champion Junior dos Santos entered this fight with a professional mma record of 17-4-0 (82% finishing rate) and he is ranked as the No.7 heavyweight in the world (currently the #1 in this division is Fabricio Werdum). JDS lost two out of his last three bouts: against Cain Velasquez in 2013 (=Velasquez vs dos Santos 3) and with Alistair Overeem in his last bout (=dos Santos vs Overeem); between these two bouts ‘Cigano’ beat Stipe Miocic (=dos Santos vs Miocic). His opponent, Ben Rothwell, has an official record of 36-9-0 (92% finishing rate) and he entered as the No.8 in the same weight class. 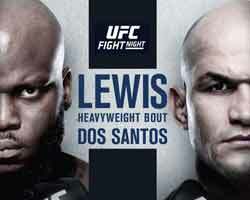 He suffered his last loss when he faced Gabriel Gonzaga in 2013 (=Gonzaga vs Rothwell ), since then he has won four consecutive fights beating Josh Barnett in his last one (=Barnett vs Rothwell).Dos Santos vs Rothwell is the main event of the UFC Fight Night 86. Watch the video and rate this fight! Review: 2014-12-13, nice and tough fight between Junior dos Santos and Stipe Miocic: it gets three stars (UFC Fight of the Night). The black belt in Bjj and former Ufc Hw champion Junior dos Santos entered this fight with a professional mma record of 16-3-0 (87% finishing rate) and he is ranked as the No.3 heavyweight in the world, he has fought twice in 2013 beating Mark Hunt (=dos Santos vs Hunt) but then he lost to #1 Cain Velasquez in their third fight (=Velasquez vs dos Santos 3). His opponent, Stipe Miocic, has an official record of 12-1-0 (75% finishing rate) and he entered as the No.9 in the same weight class, he suffered his only defeat in 2012 when he faced Stefan Struve (=Struve vs Miocic); after this bout he has won three consecutive fights, the last one against Fabio Maldonado (=Miocic vs Maldonado). 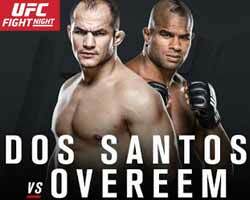 ‘Cigano’ dos Santos vs Miocic is the main event of “UFC on Fox 13”. Watch the video and rate this fight! Review: 2013-10-19, great fight with some tough exchanges, we are sure they will face each other in the future…two real warriors: the third fight between Cain Velasquez and Junior dos Santos gets three stars. Cain Velasquez (12-1-0, 83% ko/tko victories – curiously he has never won by submission) entered as the No.1 heavyweight in the world while Junior dos Santos (16-2-0, 88% finishing rate) entered as the No.2. 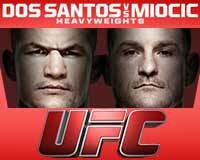 In their first fight ‘Cigano’ dos Santos defeated Velasquez by ko (November 12, 2011) while in their second bout Cain defeated JDS by unanimous decision (December 29, 2012); this third fight, main event of UFC 166, is valid for the UFC heavyweight title (Velasquez’s second defense). Watch the video! Review: 2013-05-25, Junior dos Santos vs Mark Hunt is close to get four stars thanks to a spectacular finish (UFC Fight of the Night). The Brazilian Junior dos Santos (15-2-0, 86% finishing rate) entered as the No.2 heavyweight in the world while Mark Hunt (9-7-0, 67 % finishing rate) entered as the No.8. 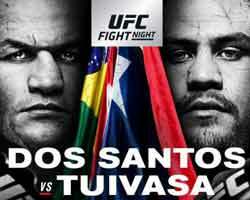 ‘Cigano’ dos Santos vs Hunt is on the undercard of Cain Velasquez vs Antonio Silva 2 – UFC 160. Watch the video!